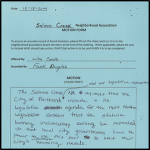 Neighborhood associations are required to include a list of members in attendance in their meeting minutes. The easiest way to collect this information is through a sign-in sheet. 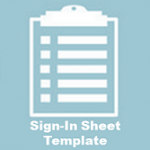 Sign-in sheets can also provide an easy way to sign people up for your listserv or newsletter. 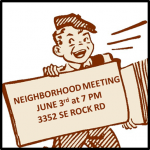 Neighborhood associations are required to provide general and direct notification prior to any general, board, special, committee, or emergency meeting. The following document outlines the minimum notification requirements set by the ONI Standards. However, each neighborhoods’ bylaws may have additional requirements. Neighborhood associations must follow open meeting laws for discussions and decision-making as defined in the ONI Standards. The following document outlines what decisions require a vote, the voting procedure, and what types of discussions can happen outside of a public meeting. 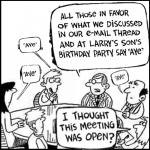 Meeting facilitation is no easy task. 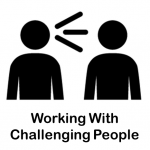 It takes time and practice in order to find your best leadership style. Here are some tips to get started on the right foot. As a neighborhood association board member you will work with people from a variety of backgrounds and viewpoints. This can be both rewarding and difficult. 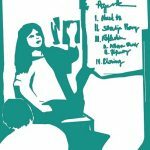 Here are some tips for handling those trying moments.